Your closet is likely one of the first and last places you visit as you move through your day. The way you choose to present yourself to the world each and every day - whether that means your most chic dress or your inspiring work-out gear - your closet is where you make those decisions. As Marc Jacob says above, your clothes will just 'be there' your closet until you are truly living in them. And truly living in your clothing and bringing them to life is made possible with a great closet design. A curated life means beginning and ending every day in a space that works for you and makes you feel special. A designed closet reflects your style, tastes, needs, and habits. If you are never going to put each pair of shoes away in a clear plastic bin at the end of the day, then design your closet with open shoe storage instead. A well designed closet reflects how you truly live, and makes your life easier every day. Understanding the needs of the homeowner was of utmost importance in creating this beautiful walk-in Master Closet in our Horseshoe Bay Lake House. Whether we are designing a small closet area, a walk-in closet, or a full dressing room we begin by discovering your wants and needs with a questionnaire. Remember that the number of items in each category dictates your storage needs and thoughtfully planned storage not only functions well, but looks polished. And when your clothing and accessories are stored in a clear and polished way, you will walk out of your closet feeling even more sophisticated and stylish. The benefits include determining exactly where the doors, windows, electrical, and lighting are placed. The design process for this glamorous walk-in was made even more fun working side-by-side with one of our favorite partners More Space Place Austin. This project was a ground-up new construction home located right on the waterfront. 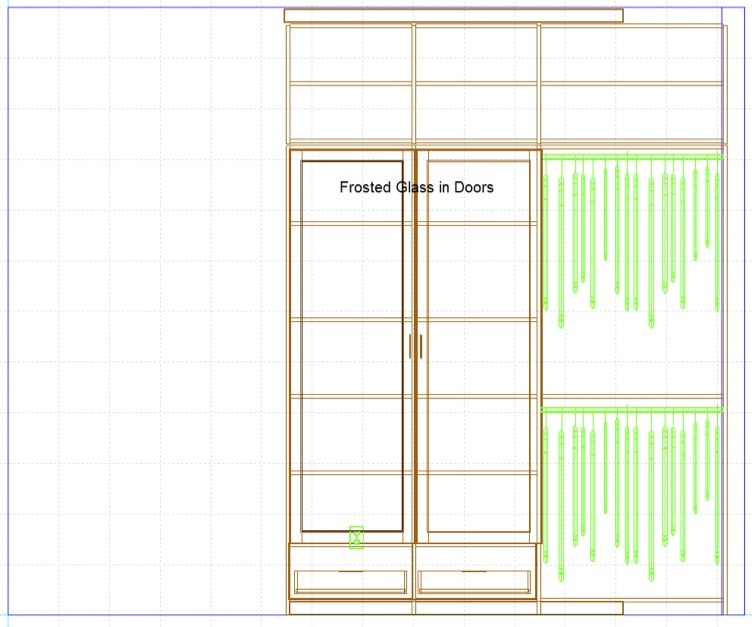 We were lucky enough to start with the floor-plan drawing of the closet area (which we had the ability to adjust a bit as we were an early part of the design/build process), and let our design imaginations go from there. We incorporated windows for natural light, layered lighting, and concealed utilities throughout given the blank space we started with. Oh - and a touch of glam! This closet is designed with a distinct 'his' side and 'her' side ('her' side shown above). Each designated area has a full set of dresser drawers, both open and closed shelving, short and long hanging spaces. We also concealed several hampers so that dirty clothes have a place to go right away. And take note of that full wall of shoe storage to the max! Let's just say that there is no feeling first thing in the morning like a plush rug underfoot! In this instance, we used a plush flokati rug. Your style might be better reflected in a colorful patterned rug, or a wood floor with heating underneath. In any case, comfort underfoot is key. While seating in a closet might feel like an unnecessary 'extra', just think of the times you have leaned against the wall while tying your shoes or teetered around strapping your highest heels on. A comfortable chair or ottoman ensures no trips to the emergency room. Function or form? In this case we say both. Functional can look beautiful and is another opportunity to reflect your style. My anxiety level instantly rises in a disorganized closet! Knowing where everything is and being able to see all of your options in an organized and beautiful space allows you to focus on where you are going and how you want to present yourself. If your socks are shoved in a drawer and not paired and sorted by color, you'll waste valuable time digging through drawers. I do hear you - I used to think that this level of organization would take so much time and energy every week when laundry was done. I myself took the time on a long weekend to organize by type, color, season, and everything paired or folded. And the extra few minutes that I take each week when putting laundry away pales in comparison to the time it used to take to sift through all of my tights and socks that were not paired to find just the right match for my outfit. And honestly, I am a more stylish and glamorous woman because of the couple of minutes I take on Sunday afternoon. Organization in a closet comes in many forms. Hanging, folding, storing, protecting, cherishing. Each of these methods requires its own set of tools that are well worth the investment. Throw away those wire hangers and plastic bags from the dry cleaners! Invest in a matching or coordinated set of hangers - wood and velvet are our favorites. Velvet hangers are very thin and allow for more items in a small space. However, since they are so thin, your jacket shoulders will not be served well with these. Wooden hangers or padded satin hangers can be plugged in as necessary. It's just a wonderful feeling that sets the right tone for your day when your hangers are coordinated. It is also immensely helpful to hang by type and color. So all blouses together from light to dark. Then all of your t-shirts together from light to dark. And so on. Rather than rifling through all tops together, you will save time knowing that you are looking for your light pink blouse and you can reach exactly where that blouse is kept. No thought process and no frustration. And my favorite tip - hang your pants at full length! Yes, you might lose some space above or below, but your pants will not have any creases from being folded - and if you are like me and have many many pairs of black pants... this is a super easy way to flip through and find just the right pair for the day. Please also take extra care with your special items. Some treasures require proper storage rather than just hanging or folding space to protect them. Be sure to account for these needs in your design and you will be able to enjoy your pieces for many years to come. Mirrors are an easy way to create an open feeling in a space. You also really want to have the opportunity to make sure you haven't tucked your skirt into your knickers! A full height mirror should be placed in an area that you can step back and see all of the angles. We lined the back of the dresser area in our featured closet with a mirror for that last check on earrings and lipstick. Without proper lighting, you'll never know if your LBD is actually an LND (little NAVY dress). In the morning, natural light is best for a true rendering of color, however this is not always possible. Layers of light makes the task of choosing what to wear and how to present yourself down to the last detail an enjoyable and easy experience. It's also a place to add a touch of glam! How many of you haven't lost your breath for a moment when spotting a beautiful glass chandelier in a closet! And yes, this again helps set the tone for how you want to live your life and present your best self, but it also contributes to the task of getting dressed. With a ceiling full of recessed lighting, all of the colors in your closet can be rendered correctly and every corner illuminated. Task lighting above your jewelry and accessories let's you see the sparkle before you put it on. And if you want to dim all of the lights and leave just the chandelier on, you get a lovely preview of how your outfit will look on your special date night. Controlling the light can be done with electrical illumination but also through the use of window treatments - whether a lush pair of draperies, a fabric roman shade, window film, or a decorative screen - window treatments control the flow of light into the space and also provides protection from sun damage. Just like in life, your closet will also have some secrets that passers-by won't be able to detect. A few of the secrets that every closet should hold are hidden jewelry storage (you don't want everything out and gathering dust), a pull-out valet bar for tomorrow's outfit, an ironing board and the ultimate time saver - a steamer! Doors on the cabinets are another way to both break up the space as well as provide privacy. A combination of open and closed storage provides a dynamic design as well as opportunity to conceal items that you don't want to see every day. Doors can be decorative with clear or frosted glass, mirrors (remember, reflections of you above), or even fabric or wallpaper to bring some pattern into the space. We all carry our phones with us everywhere, and the closet is no exception. Including plenty of outlets in convenient location ensures that your phone will never lose its charge. "A wise woman skips the stock market and invests in her closet." So get busy. Invest in your closet. And if you have any questions - just drop us a line!